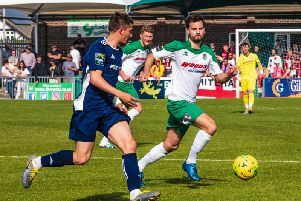 Horsham exited the Velocity Trophy on Tuesday night to a Bracknell Town side that Dominic Di Paola said are the best they have faced all season. The Hornets crashed out at the first round stage of the league cup with a 3-1 defeat away to the Bostik League South Central Division leaders. Gavin James gave the hosts an 18th-minute lead and that is how it remained at half-time after a tight first period. Lee Harding should have put the visitors level in the second half but shot wide, although Rob O’Toole did tuck home a rebound from Tyrell Richardson-Brown’s shot on 57 minutes. However, lapses in defence let the home side in twice more as Adam Cornell and Kane Fitzgerald netted to keep up Bracknell’s unbeaten start to the season. Di Paola said: “It’s frustrating to go out, but I am not going to cry over it - it’s a competition we were never going to win and we were going to play the under-23s in it this year, but typically they have had games on both nights we have played in it. “We have had a few players out either by injury, holiday or unavailability which has effected things a little bit. “But I thought we played really well and they are the best team we have played so far this season. “We hit the post and had some good chances that we did not take, but it’s a both boxes situation. “In the second half, we were sloppy defensively again, but to be fair the boys did not panic and played some of the best football we have played all season. “When we went 2-1 down it took the stuffing out of us a little bit. We are playing well, but there are things we have to be better at. “They are a side that I think will win that league. Their front four were very, very good and probably won them the game with their quality. Despite the defeat, Di Paola remains upbeat and again saw a number of positives from his side’s display. He added: “Tyrell Richardson-Brown and Rob (Smith) were brilliant and Lee Harding has his best game for us up against a good player. Horsham: Pelling, Metcalf, Hartley, Harris, Hyde, Lovegrove, Hoare, Hayward, O’Toole, Richardson-Brown, Harding. Subs: Boswell, Coleman, Farmer, Punter.